Seoul Mayor Park Won-soon announced Sunday that the city government would invest 1 trillion won ($893 million) to tackle regional inequality within Seoul. According to the plans, the city government will introduce a set of investment measures to prioritize the development of northern Seoul -- including a plan to establish four new metro lines and relocate a number of government offices to the relatively lesser developed parts of the South Korean capital. 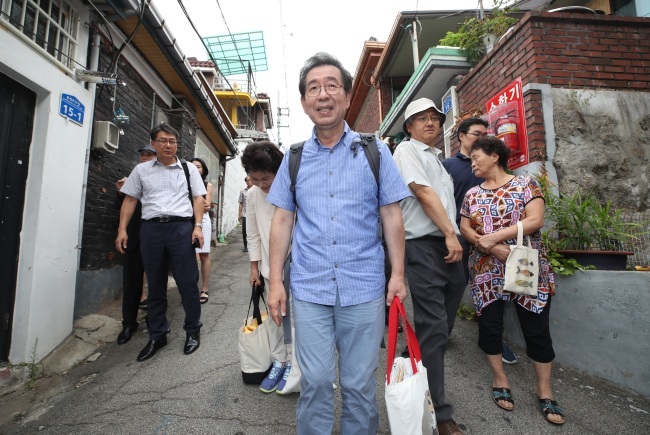 The announcement was made after Park moved out of his temporary residence -- a rooftop dwelling without air-conditioning -- in an impoverished neighborhood in Samyang-dong, northern Seoul. Park lived in the property for a month to “experience” the everyday reality of those living in some of the poorest regions in the South Korean capital. “Today’s regional inequality that exists between southern Seoul and northern Seoul is a result of the city planning that took place in the 1970s,” Park said in a statement. Regional inequality in Seoul has increasingly been considered an alarming issue. The wealthiest districts in Seoul -- Seocho-gu and Gangnam-gu -- are all located in southern Seoul. Meanwhile Gangbuk-gu -- generally referred as the northern Seoul area -- where Park’s temporary residence was located, is one of the four poorest districts in the South Korean capital. As of last year, households in Gangbuk-gu on average had income of 3.1 million won a month, while those in Seocho-gu made 5.1 million won. The new scheme includes a proposal to relocate a number of government entities, including the Seoul Human Resource Development Center, Seoul Institute and Seoul Housing and Communities Corporation, to northern Seoul areas. The three are all currently located in affluent southern Seoul districts. A total of four new Seoul Metro lines will also be established, two in western Seoul and another two in northern Seoul. Seoul City also plans to build 90 percent of its new, state-run day care centers, 486 of them, in non-Southern Seoul areas by the year 2022. It also has in the works to establish 730 total care institutions for young children in non-southern Seoul areas by the same year. Seoul City is also to purchase up to 1,000 residential properties that are going unused by the year 2022 and operate them as state-run rental housing, especially for young newlyweds. A new children’s hospital is to be built in the northern Seoul area as well, Seoul City added. To tackle inequality in education, 29 public schools in northeast Seoul that currently do not have school gyms will be provided one each by 2022. A total of 20 state-run libraries, as well as 11 educational entities that focus on art education, will be built in non-southern Seoul districts by the same year.